Jerry is the author of more than 190 books with sales of more than 70 million copies, including the bestselling Left Behind series. Jerry Jenkins has been steeped in the craft of writing for more than 40 years. With 21 New York Times bestsellers (seven debuting at #1), 186 books, and over 70 million copies sold, he has become one of the most commercially successful writers of our time. Lucky guy? An overnight success? Hardly. Jerry's from-the-trenches perspective on how to achieve success is quite the opposite of a conventional approach. He espouses working fiercely and with discipline and leaving the results to the marketplace. "Left Behind was my 125th book — but not a lot of people realize that." Jerry wrote that 16-title culture-shifting series for Dr. Tim LaHaye, and the publishing world now refers to it as "the Left Behind phenomenon." Several books in the series hit the New York Times bestseller list, selling over 62 million copies. Even with such milestones defining his career, Jerry remains a generous and enthusiastic mentor to writers around the world serious about improving their skills and realizing their dreams to be published. His biggest tip for those hoping to be the next bestselling author? "Never make it your goal to write a bestseller," he says. "Relentlessly pursue being the best writer you can be every day, telling that one meaningful story that lights you up. If you do that, you're a success; your part is done. Every other factor — the market, the sales, the reviews — is truly out of your control." While the past two decades have rendered mind-blowing rewards for such discipline, Jerry says the work of writing will always be just plain hard. "I can't say I love to write," he says, smiling. "I love being a writer, and having written. If writing comes too easy or you're having too much fun at it, you aren't doing it right. But words well crafted can affect people's lives. That's the fun part; that's when it gets rewarding." Jerry has seen unprecedented success in both fiction and nonfiction. His insatiable pursuit of great stories has led him to achievement as a biographer to icons such as Hank Aaron, Orel Hershiser, Walter Payton, Meadowlark Lemon, Nolan Ryan, Mike Singletary, B.J. Thomas, and many other men and women. The Hershiser and Ryan books reached the New York Times bestseller list, as did his most recent work, The Matheny Manifesto, with baseball's most successful young manager Mike Matheny. Jerry also assisted Dr. Billy Graham with his memoirs, Just As I Am (also a New York Times bestseller), which he considers the privilege of a lifetime. For the full list of Jerry's published books, click here. 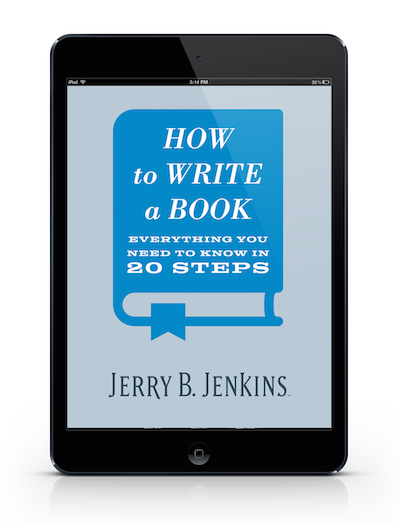 Jerry recently launched the Jerry Jenkins Writers Guild to coach aspiring writers in both fiction and nonfiction. Here, he helps writers sharpen their skills and stand out in today's print and digital publishing arenas. The Guild is slated to soon launch online writing courses for beginning, intermediate, and advanced fiction and nonfiction writers. Jerry began his career as a sports writer and later wrote the nationally syndicated sports story comic strip, Gil Thorp. He also served as Editor of Moody Magazine and eventually became Vice President for Publishing for the Moody Institute of Chicago. He has served on the Board of Trustees at Moody since 2000. Jerry has been awarded honorary doctorates from Bethel College (Indiana), Trinity International University (Illinois), Colorado Christian University, Huntington University (Indiana), and Tennessee Temple University. Jerry also owns Jenkins Entertainment, a filmmaking company run by his son Dallas, which produced Hometown Legend (named one of the Top 10 family films of 2002); Midnight Clear (named Best First Feature at the 2007 Cinequest Film Festival), and What If... (nominated for Best Family Picture of 2010). Jerry's writing has appeared in Time, Reader's Digest, Parade, Guideposts, and dozens of other periodicals. He also served for many years as a contributing editor to Writer's Digest. Newsweek magazine featured Jerry and Tim LaHaye on its cover as "The New Prophets of Revelation." He’s also been featured in The New York Times, The Wall Street Journal, People Magazine, Time, USA Today, Newsweek, The Associated Press, Entertainment Weekly, and on many national TV broadcasts, including 60 Minutes, Nightline, The O'Reilly Factor, Larry King Live, Morning Joe (with Joe Scarborough), CBS This Morning, Fox and Friends, and Good Morning America. As a marriage and family author, Jerry has been a frequent guest on Dr. James Dobson's Focus on the Family radio program and is a sought-after speaker and humorist. Jerry and his wife Dianna live in Colorado, have three grown sons, and eight grandchildren.